I am a little baffled, but more amazed that this is my FIRST alcohol post. Really…I am in awe?!? 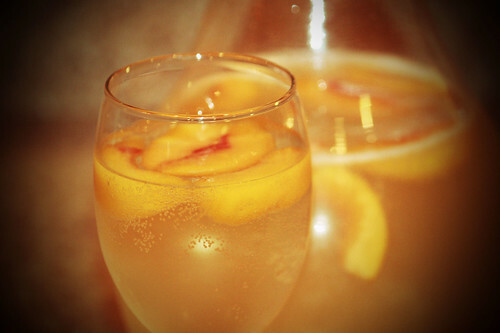 Anyway, I am thrilled to share my recipe for my awesome White Peach Sangria Recipe. This is requested at every party, get together and random Tuesdays. 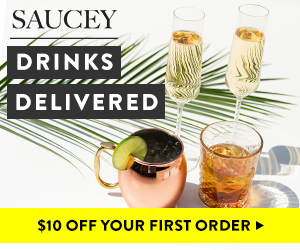 It’s one of my all-time favorite drinks and I think it will become yours too! I am making this today for two reasons. 1. My lifelong BFF’s baby boy is turning ONE tomorrow! 2. My baby-I-just-had-yesterday is turning ONE on SUNDAY!!! She & I were so lucky to share our pregnancies together, and now our babies growing together, but I am still a little sniffly thinking they will be ONE already! So I needed a little “Momma Juice” as Michael calls it! I am horrible at measuring anything going into a drink. I am a “add it, taste it, and see” kind of gal. I did my best this time to give rough measurements. Rest assured, that if you don’t measure (like I never have) your drink will turn out just fine (like mine always do). I also measure in cups and not ounces…for the fact that, well, it’s just more convenient and I never make a single glass of this stuff. It is always made by the pitcher! Peaches (fresh or frozen) I prefer frozen because they act as ice cubes! *If you do not have peach flavored vodka you can substitute regular vodka + peach schnapps. I made it this way first before all the flavored vodkas became a “thing”. 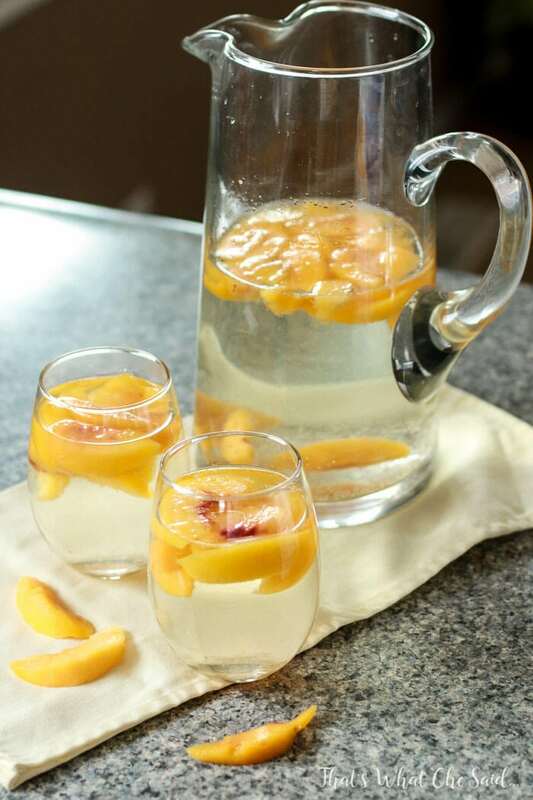 If using fresh peaches, slice and add to a serving pitcher. If using frozen just open the bag and dump them all in! About 2 cups, no need to thaw! Add peach flavored vodka (or vodka and peach schnapps) and the entire bottle of your wine. Yep, the WHOLE dang thing! You will thank me later! Let the peaches soak up all the wonderful liquor fantastic-ness for about an hour in the fridge. After an hour or more chilling in the fridge, fill the remainder of the pitcher with your favorite white soda once you are ready to serve to preserve a bit of the fizz. I am partial to Sprite for some reason. The extra citrus flavor really goes well here. *It’s best to use chilled wine and soda so that you may partake in your beverage at that EXACT MOMENT! I am really strange and DO NOT like ice in my drinks –it just waters it down! Also to spice up the drink a bit you can also add quartered grapes or a few blueberries! 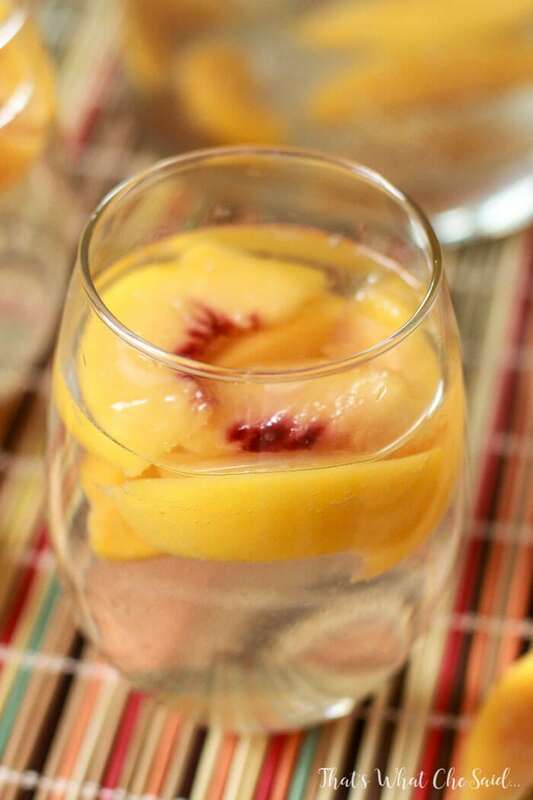 Pour into wine glasses and float a few of the liquor-soaked peach slices! Once your drink is gone you get a little treat eating the vodka-peach slice! 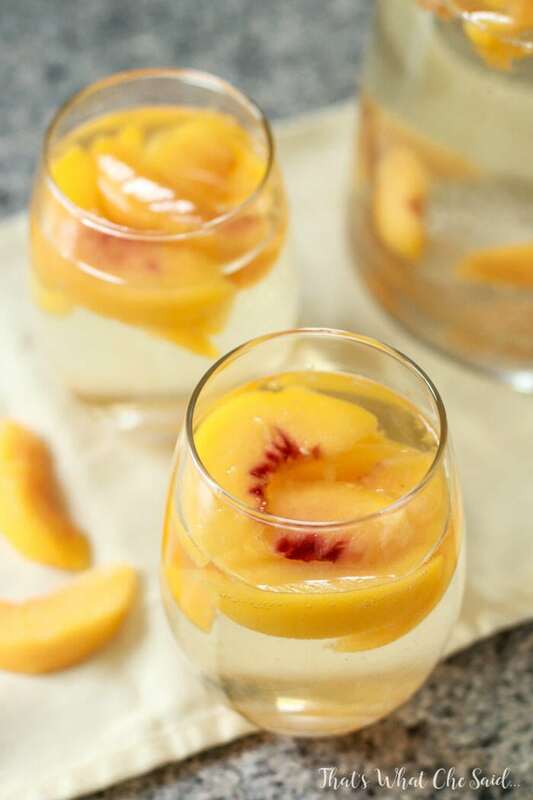 A light and refreshing white peach sangria! This is perfect for summer drinks on the patio! Fill the remainder of your pitcher with white soda. Your ‘disclaimer’ made my day! This sounds tasty! I usually drink red sangria, but white peach sounds good! Yum! 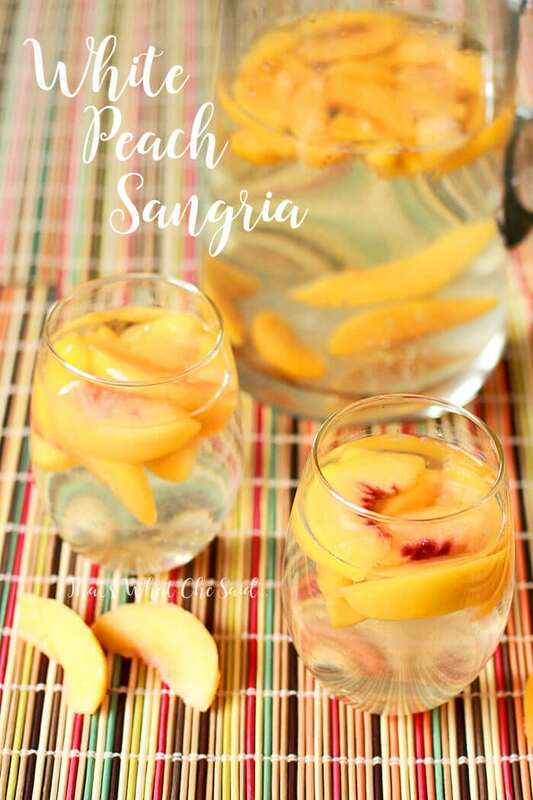 I’ve never had peach sangria and this sounds delicious. Thanks! It really is! I may or may not have that in my refrigerator right now…and almost all the time. It’s so refreshing! Coming from living in MN where it’s COLD all the time I am just loving having it ready to go in the fridge this summer now that I am in warmer climates! Thanks for stopping by! Your disclaimer is hilarious…If you have a moment today, please share this with my readers @Creative Juice Thursday Hope to see you there! This sounds amazing! Thanks for sharing! P.S. love your sense of humor!!!!!! !